This isn't going to be a long entry but enough people have emailed me about meeting Tom that he's become a character in this little narrative we've got going. We threw him a surprise birthday party and it was exactly as wholesome as you'd expect, ending with a trip to A&E (because what good party doesn't end in a trip to A&E). 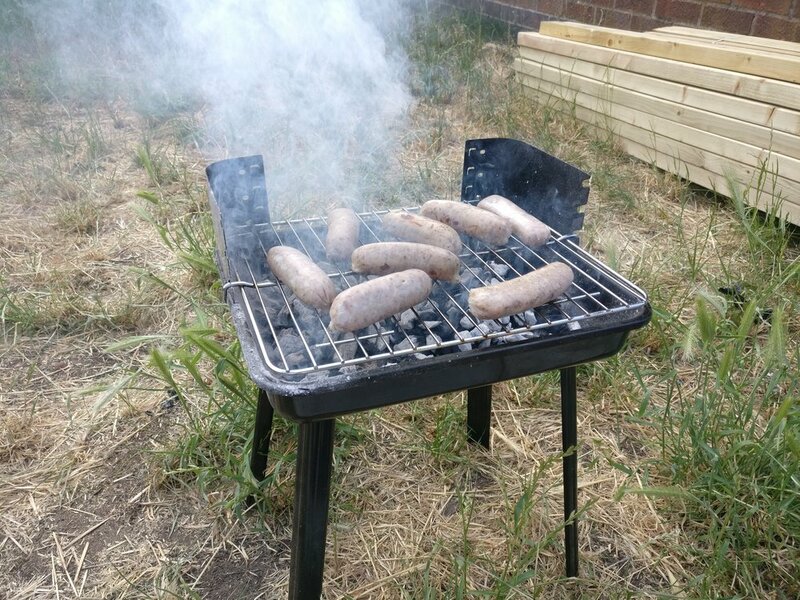 We were able to make the most of the good weather and have a barbecue! It's so funny now to look through the video I made at our offer holders' day a year ago and see how many faces we now recognise between us - three of us in this photo all met at our interviews and have been good friends since! This morning our exam results were released (at least whether we'd passed or failed) and I actually woke up 15 minutes late. Regardless, 15 minutes late, I found out that I'd passed my exams (both the written exams and the OSCEs) and I cried - something I'm not ashamed to admit because the stress of these exams has been a brand new experience for me and the thought of having to face them again was hideous. We've all been working exceptionally hard since at least mid-March for the June sits, able to be asked virtually anything about what we've studied throughout the entire year. Equally from talking to colleagues it seems to be a mixed bag - some are disappointed with the way things have gone, deeply understandable but just another hurdle in what already feels like a very long game. As I've said before however, this is the most nurturing and supportive peer-group environment I've ever found myself in and through the student-led Regroup teaching and any additional help we can provide our friends, I have every faith they'll make it through this time. Just to capture my state of mind authentically, I was fully expecting to be dashing back to Warwick immediately after finding out that I'd failed - I only brought one change of clothes back with me and the contents of a rucsack. Quick change of plans is needed. Speaking for myself though, I'm really excited for the future - there are a ton of projects I can finally start tackling with the weight of these exams off my shoulders and I can enjoy some proper downtime. It's the end of June and we're not back at med school until mid-late September, so there's plenty of time to kick back. Planning some short holidays with friends and generally trying to make the most of the glorious weather we're being treated to at the moment. Onwards and upwards - I'll be posting occasionally on here throughout the summer if anything relevant happens but otherwise will see you all in September! As I write this, it's currently 4.24am, and I find myself sat in the lovely 24-hour McDonald's restaurant on Northumberland Street in Newcastle-upon-Tyne. I've had three exams to prepare for this semester, the first two of which have gone reasonably well, and my last one is in approximately five hours in St. James' Park of all places. Is it even a good night out if it doesn't end with chicken? I'm uncharacteristically nervous right now, at least since I really got comfortable with my best revision methods. I couldn't sleep at all and had to get out of the house, so I've been studying in the Robinson Library and will go back there shortly. More than anything I think it's just the realisation that my life is about to change significantly, for the better or worse it's too early to say. It took me a while to get settled in Newcastle, more than the first academic year and it's dawning now more than ever that it's coming to an end. Still, onwards and upwards. Cell Biology awaits, and I need to crack another can of Monster before sluggishness starts to set in. After my exam I'm booked in to go and see some guide dogs in-training at the students' union, which will be excellent in every possible way, and then onwards to Creams, a dessert bar in the middle of town to celebrate having finished.